A few days into the New Year the Aurora forecast was promising and I had just received a -40 sleeping bag that I needed to test out. With a few days off to burn there was no better place I could think of to watch the Aurora then camping on Lake George. 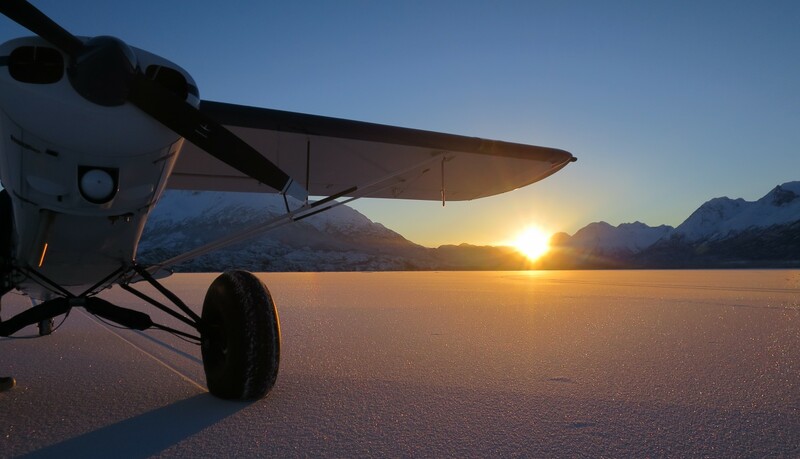 We packed up and jumped in the cub. 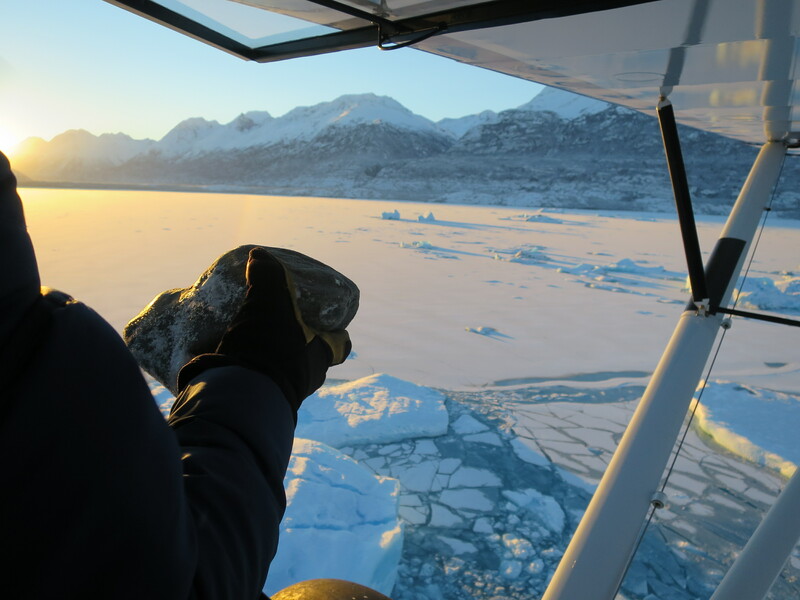 The weather had been warm so we brought a couple rocks to toss out the window to make sure that the ice was thick enough to land. Last year was my first time at Lake George. 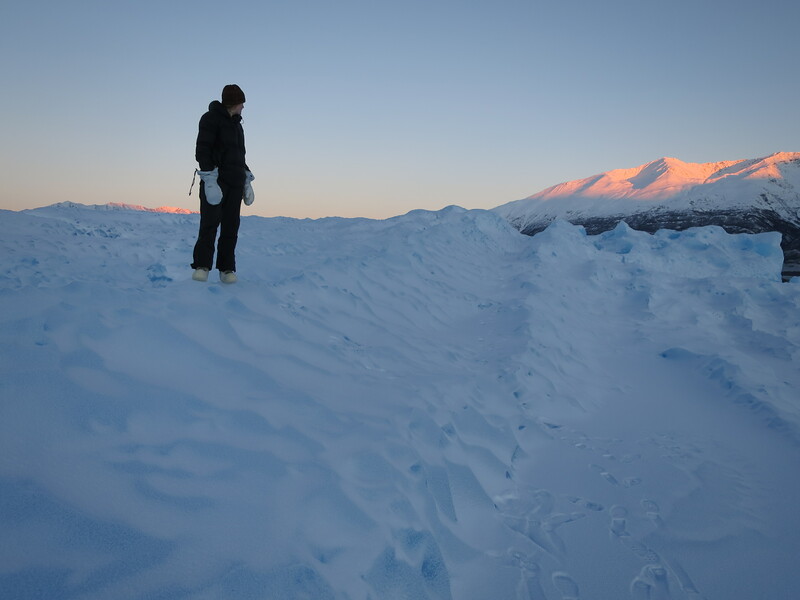 The bright blue ice caves, towering glacier and remoteness made me fall in love with it. I’m sure you can see why I love this place! 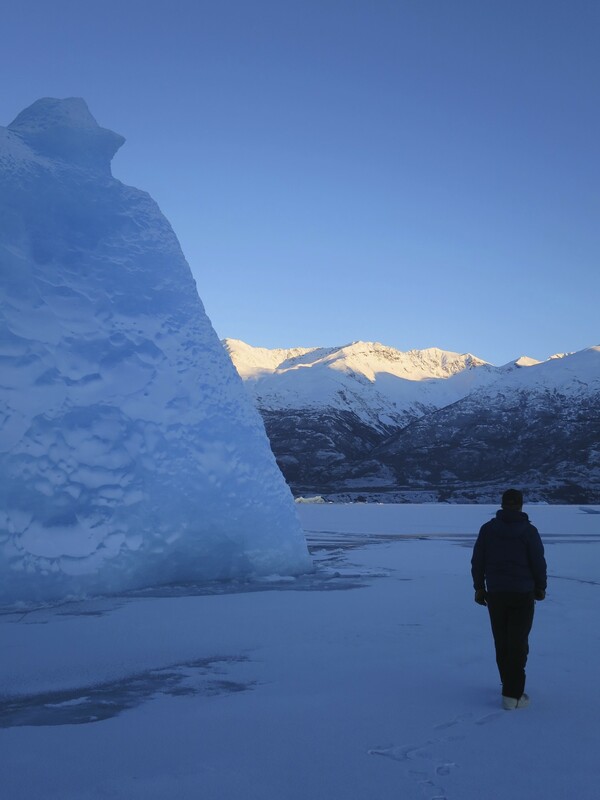 We pulled up to this massive iceberg and easily walked on. It was huge and beautiful and in my mind seemed like the perfect place to camp! 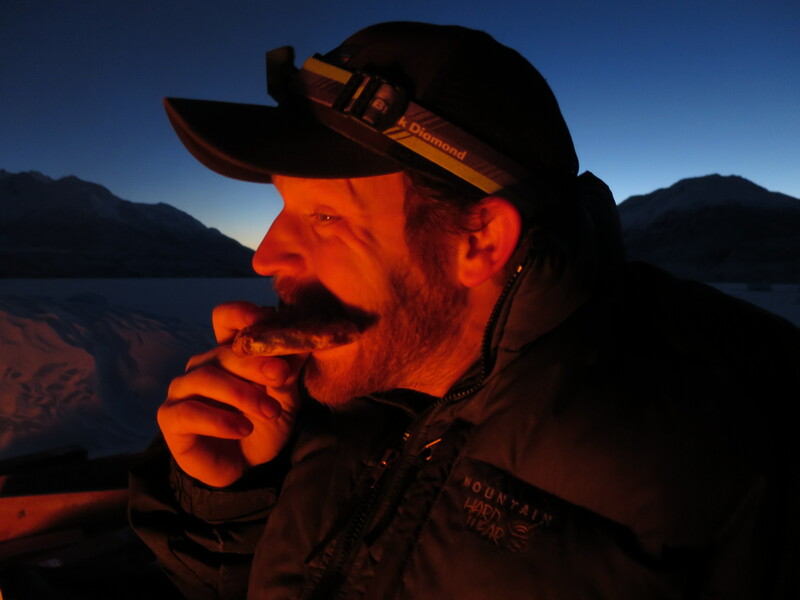 We set up our tent and enjoyed beer and Moose’s Tooth Pizza around a fire. 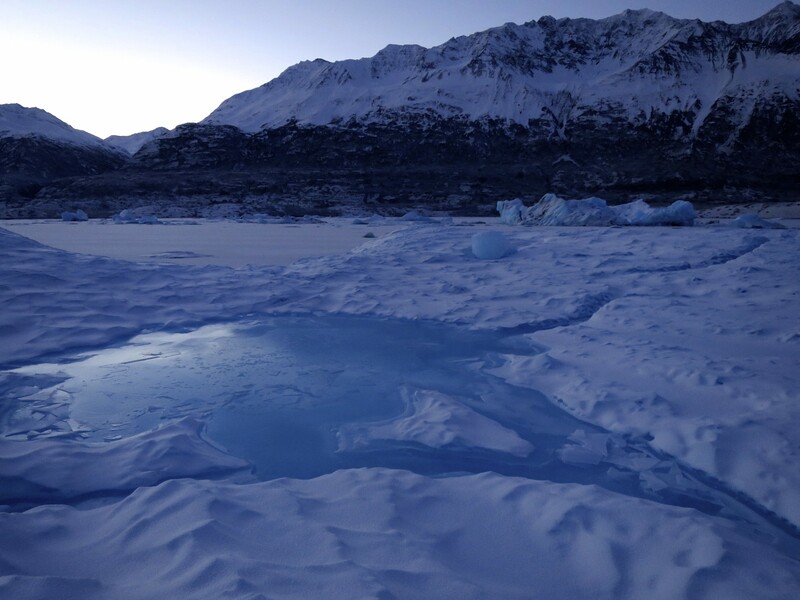 We listened to the glacier calve in the distance & the lake ice creak and groan. 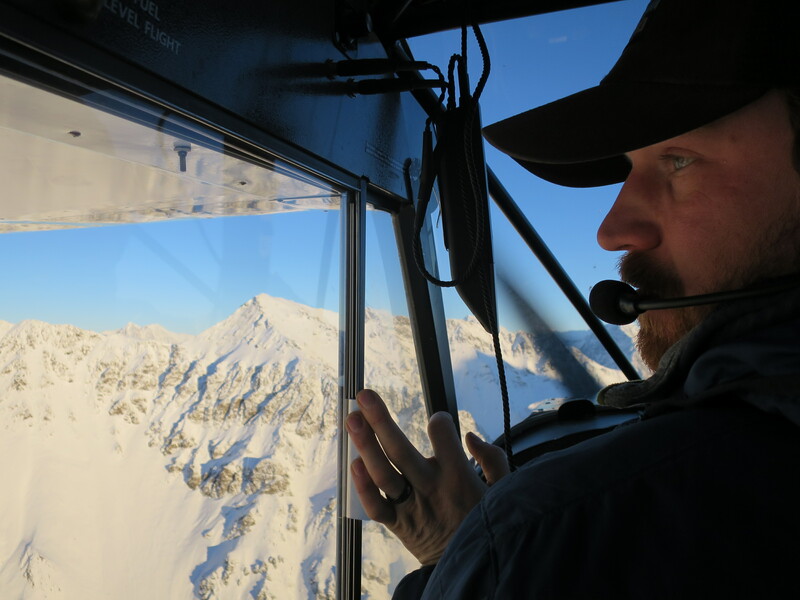 A couple of times we jumped out of our seats after hearing massive cracks coming from what seemed like right below us, but at this point we weren’t to phased… it was ice.. that’s what it does, no big deal. 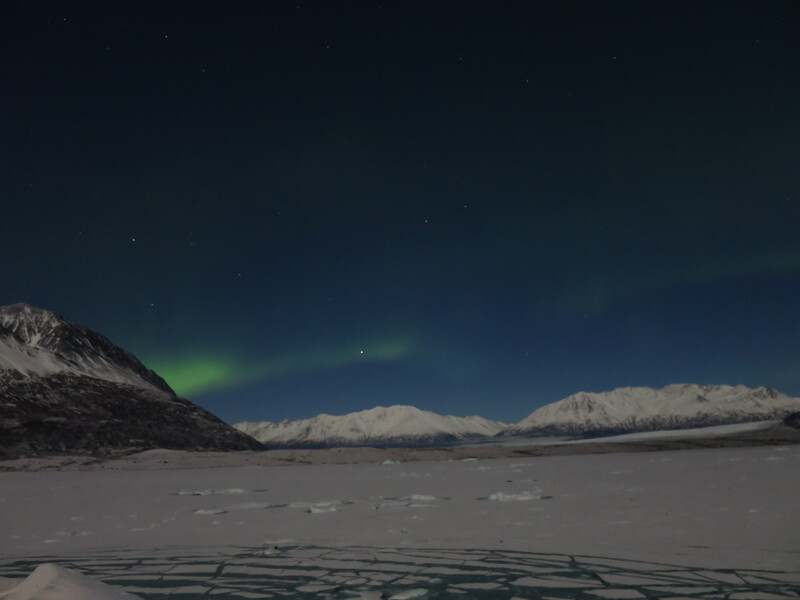 Turns out the Auroras decided to light up Anchorage while we were out looking for them on the lake. We still got a bit of a show, but mostly through the camera lens. 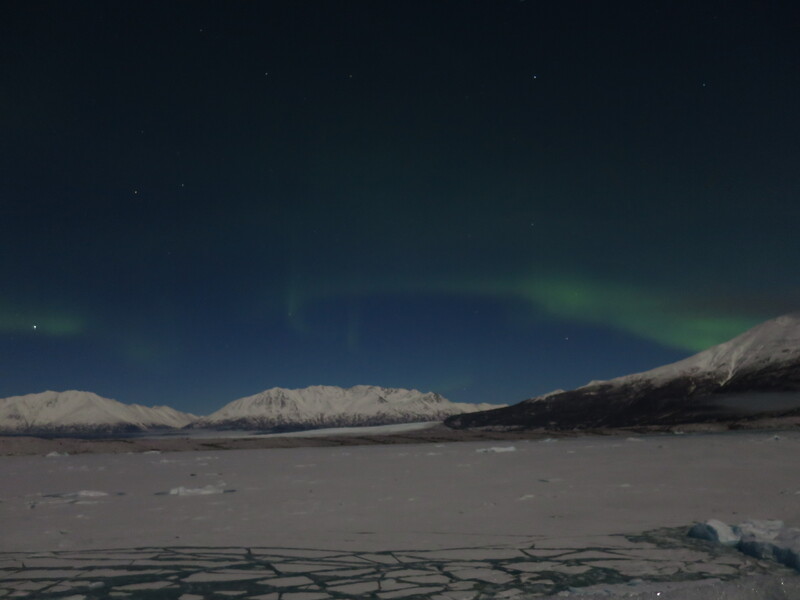 I hadn’t realized it before but Aurora is way more impressive in photos than to the naked it. So next time you see photos of the Aurora you missed out on be comforted by reminding yourself that what they actually saw probably wasn’t as cool as the pictures you are looking at. Where the Aurora show lacked the cub made up for with a display of the new LED lights recently installed. Looks like Christmas! 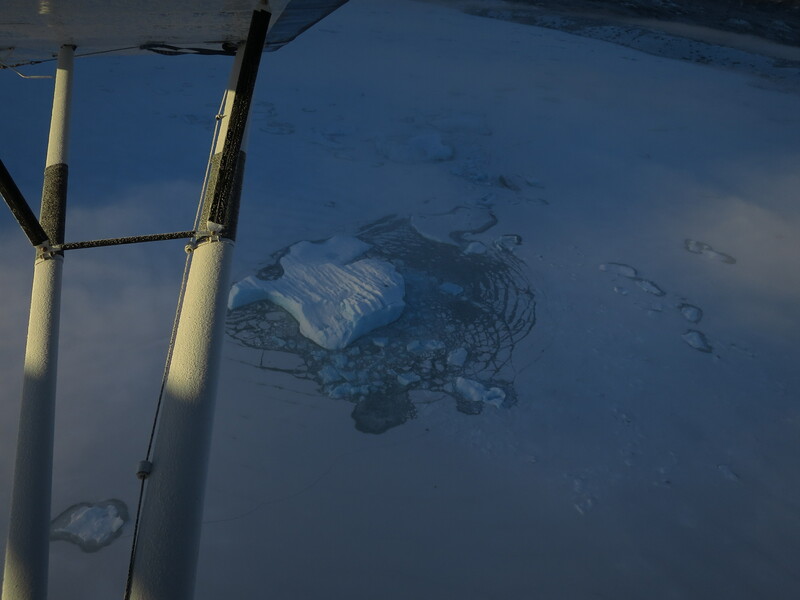 In the middle of the night, I woke to a giant crack coming from the middle of the iceberg we were camping on. I laid awake listening to the ice creak and groan and slowly grew irritated. About 30 minutes later another massive crack woke Woodsen up. I was happy to have the company as we both listened to the ice. At this point I remember asking Woodsen “so what’s the worst that could happen” without thinking he replied, “well the ice could split in half and then either side could flip over”. Thanks Woodsen, very reassuring. 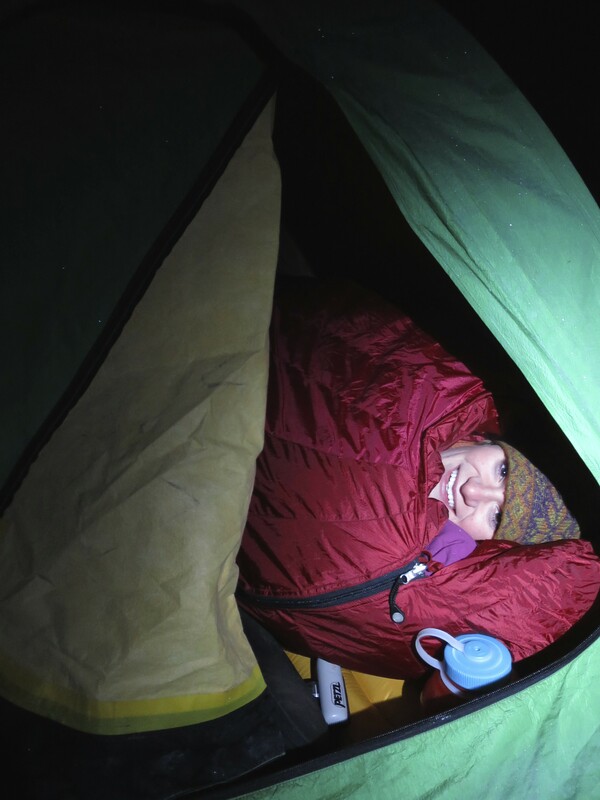 A couple minutes later we heard the unmistakable rumble of a calving ice close to our tent and it seemed to go on forever. It finally stopped after a good 30 second of nonstop calving. Now I was a bit unsettled. 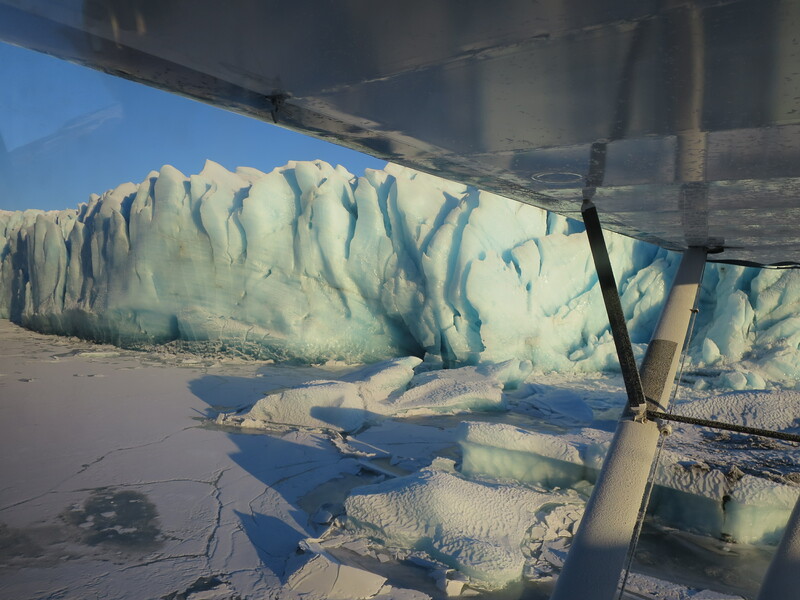 We decided to go check on the plane when we walked across the iceberg to where we could see the plane on the lake ice we found a 20-foot gap between the lake ice and the iceberg. 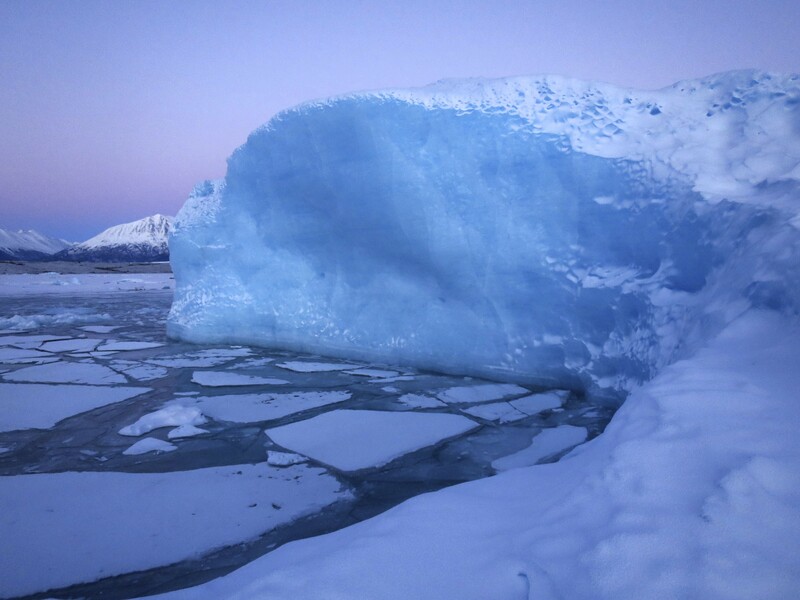 As we stood there not quite sure what to do we noticed the gap slowly getting closer then widening as the iceberg moved back and forth in the water. We walked around looking for a place to get off, not finding anything immediately we went back to our tent and dragged it and all our gear closer to the edge. I think it’s safe to say we both were thinking we were going to be “those people” that do stupid things without thinking then end up needing to be rescued or worse end up hurt or dead. 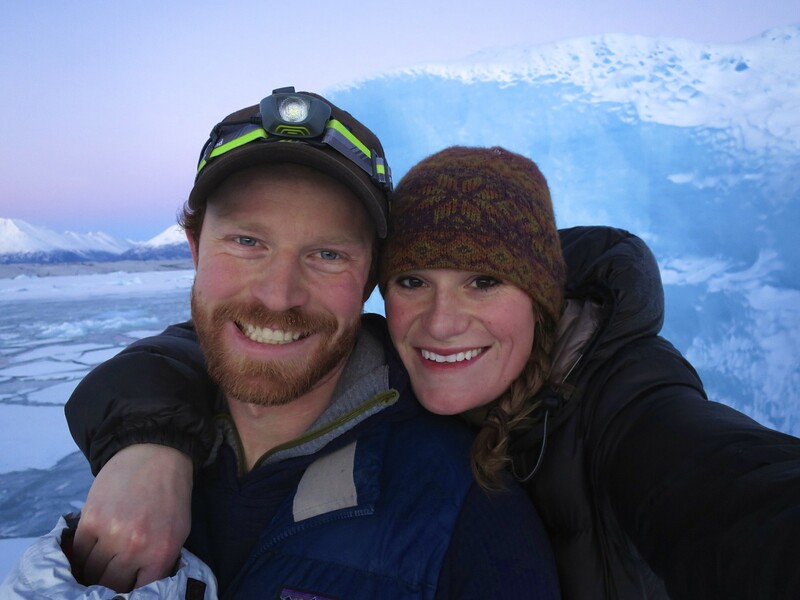 With few other options, we settled for attempting to jump on to the lake ice where the ice had been freshly cracked by the calving iceberg and we couldn’t be certain a piece wouldn’t just break away and sink. I can’t describe the intense relief when Woodsen jumped onto the ice and it held. We had gotten ourselves into quite the pickle, but now it seemed our stupidity might go unnoticed. Phew! 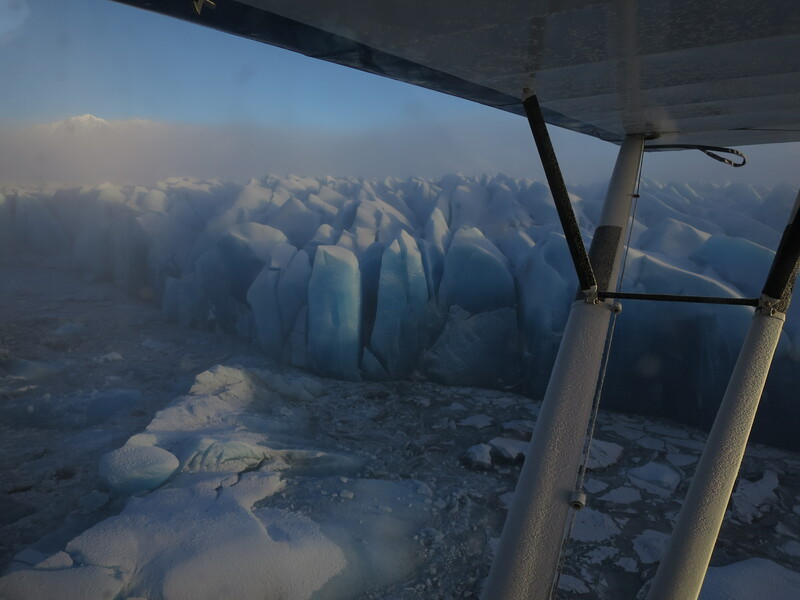 Unlike the clear day we had started with we had woken up to dense ice fog. 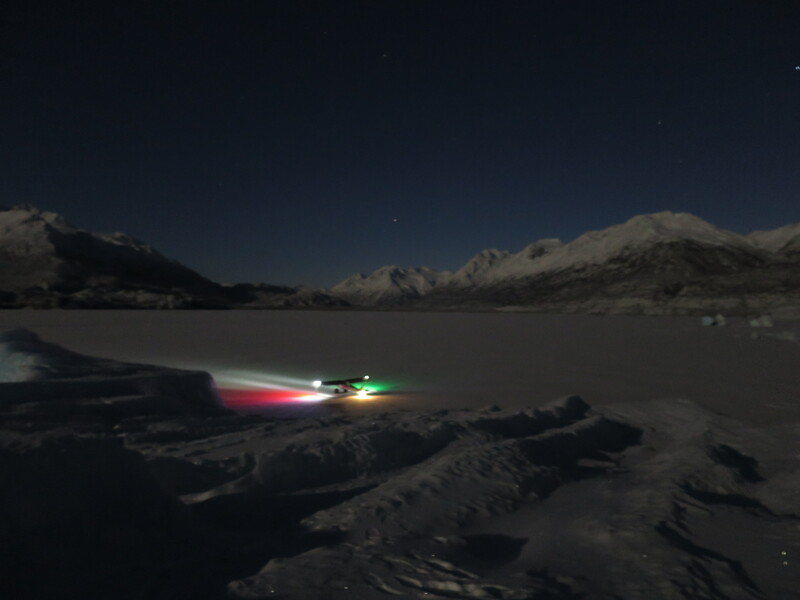 I’m sure if it had been clear we would have jumped in the airplane and headed straight back to Anchorage in the bright moonlight. 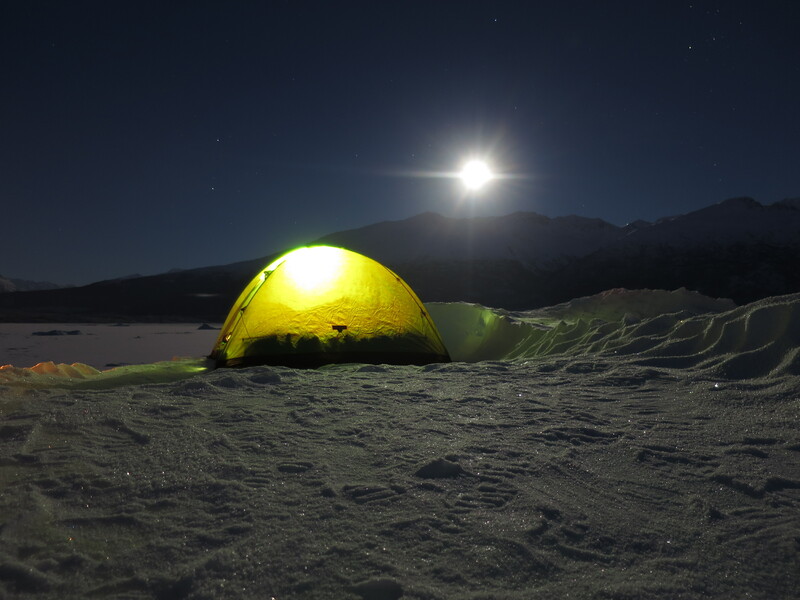 With no other option, we crawled back into our tent happy to be by the airplane and attempted to sleep on the lake ice till the fog cleared. Amazingly I was able to sleep and woke up to a hole in the clouds overhead. we packed up quickly and headed back to town. Below you can see the iceberg we camped on. 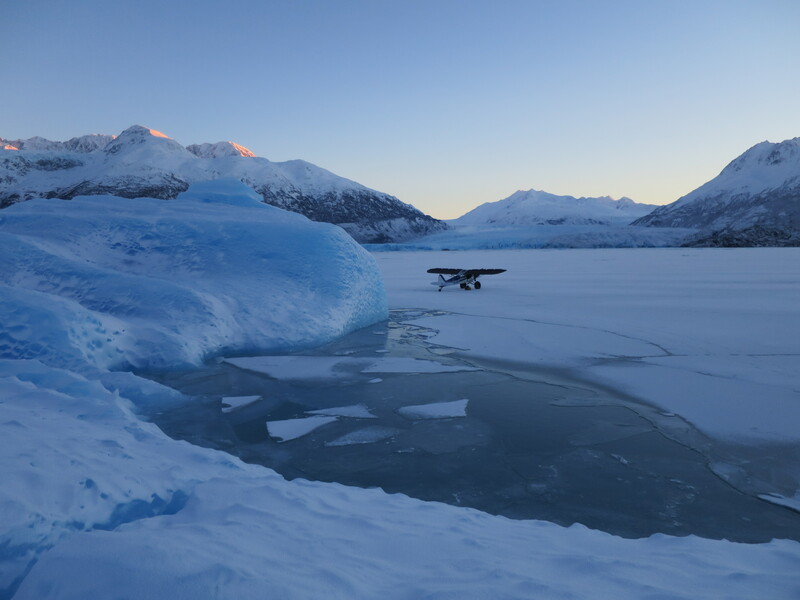 we had set our tent up on the flat spot close to the open water and floating ice chunks and the plane was parked on the opposite side. 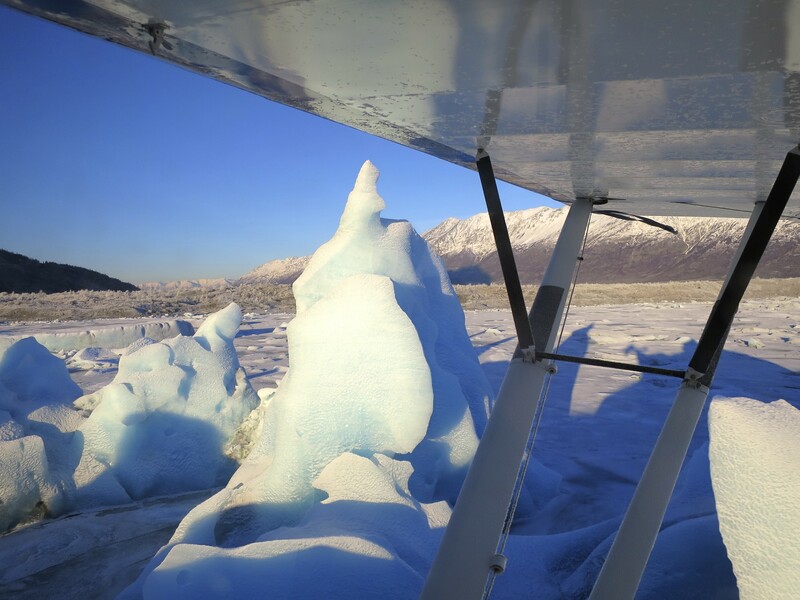 We flew out over the Knik glacier enjoying the ice in all its shapes and forms and especially thankful that we were headed home from another adventure safe and happy.